The Common Gull is the smallest og the gulls we usually see at Lista. It is gray on the wings and back and resembles the Herring Gull. Dark eyes, greesnish bill and legs, could help to distinguish it from the Herring Gull, which has yellow beak and flesh-colored legs. From the end of March and April, a considerable number of Common Gulls migrate towards north passing by Lista. There is birds that will breed along the Norwegian coast. Most of them migrate over the sea, but large flocks can also be gathered on the fields at this time. 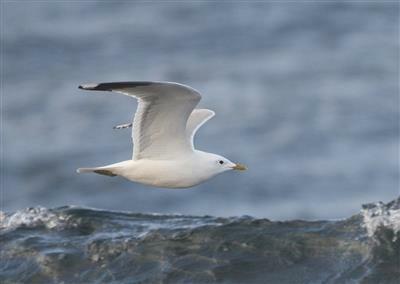 The Common Gull is decreasing along the coast. Little amounts of fish (diet) in combination with other factors such as mink (predator of eggs and chicks) is some of the reasons of its decrease along the coast. However, they are doing well in the cities, where they can nest on roofs, being more unaccessible for predators. The total number of Common Gulls registered every year usually ranges from 10,000 to 20,000 in the period 1990-2014. Good years when the spring migration has been closely followed (1995 and 1997) show far higher numbers. The Common Gull has been declining as a breeding species locally and nationally. The good years in the '90s may therefore have had a background in a larger total population, but we are otherwise unsure of whether our total number are suitable for assessing any population trend. Note: Mew Gull is the American name for Common Gull. This graph shows the timing of migration throughout the year, taken from the observations of our daily counts. The number is the total number of years for all years. Note: our counts in spring are from March 15 to June 10 and in autumn from July 15 to November 15. This graph shows the number of observations distributed by years. The yellow line is the average for all years.